My roommate’s Brewers penguin lost an eye last week. This week, we gave him a better one. Bonus: I used blue and gold wires. Go Brewers! 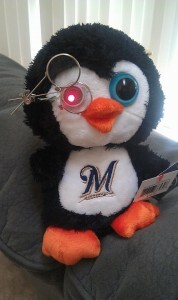 This entry was posted in Uncategorized and tagged brewers, cyborg, Penguin, red eye, stuffed animal. Bookmark the permalink.